Rebuilding has been slow in the New Zealand city of Christchurch following the earthquake that rocked the island nation in 2011. With many buildings “red-zoned” and deemed unsafe after the quake, it has taken time for the city’s damaged infrastructure to be rebuilt. 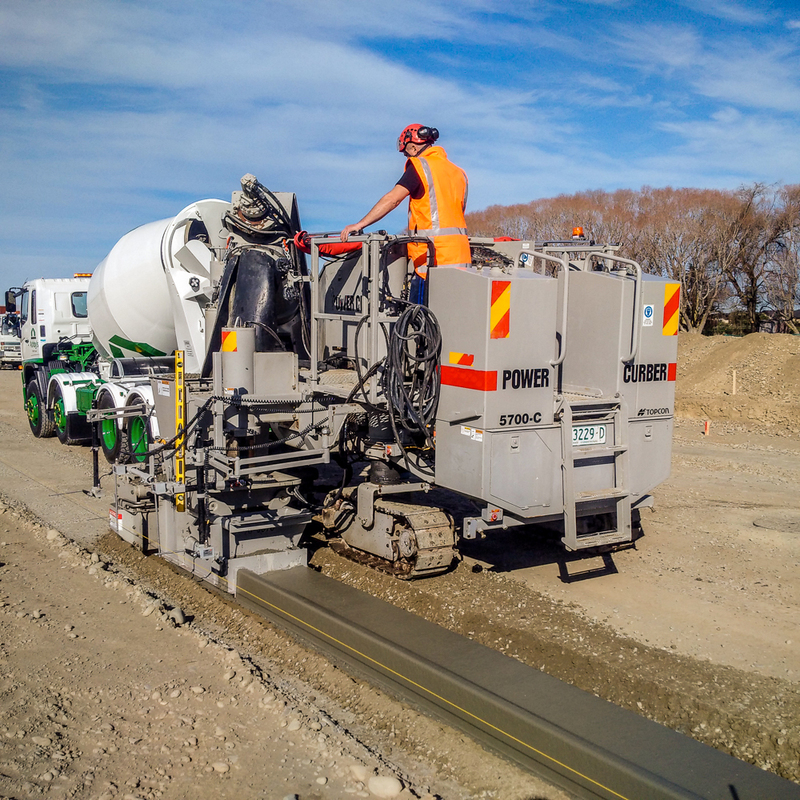 With the construction of new roads and developments now in full swing, new Power Curber owner A E Smith Contractors is doing their part to help rebuild and carry Christchurch, the oldest city in New Zealand, into the future. Shayne Smith started curbing with his father some 20 years ago, and bought the business from him a few years back. Shayne is a champion of slipforming, and sees it as an opportunity to replace handformed curb and paths in the city. 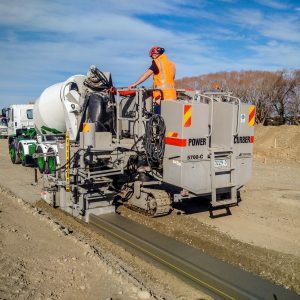 “It’s a much stronger product and goes in more quickly, so that has to be more appealing for new construction in an area like Christchurch,” says Shayne. Christchurch is the largest city in the South Island of New Zealand. Shayne and his wife Nicole recently purchased a 5700-C and found a supportive client who believed in slipform technology and the Smiths’ ability to be successful with their Power Curber. They’ve been pouring 21″ (530 mm) curb and gutter in a new housing development. The transition from handforming to slipforming has been a smooth one for the Smiths. 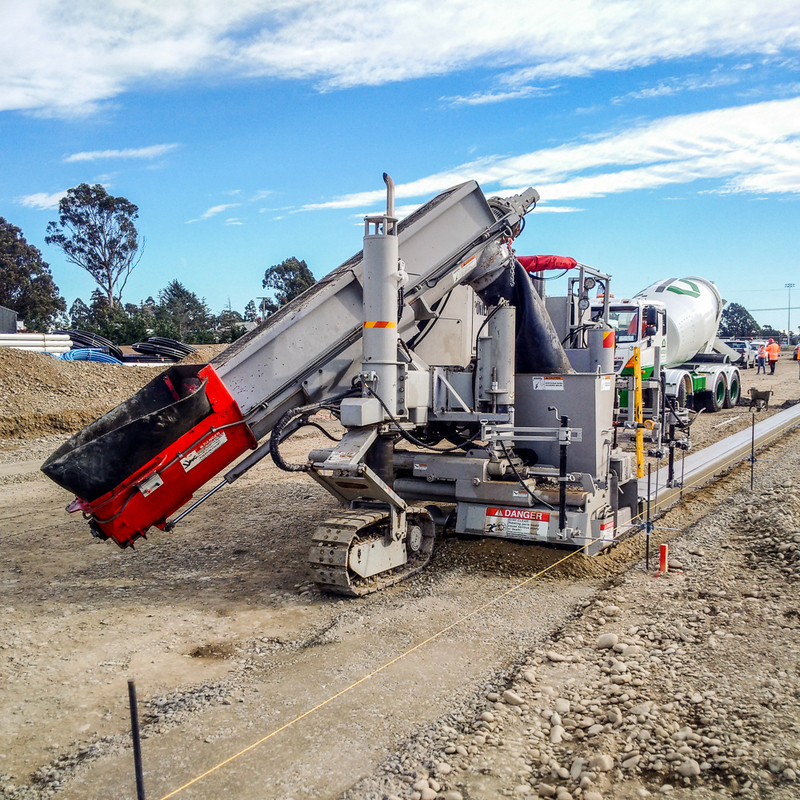 Their customers, along with the A E Smith crew, have been pleased with the addition of the 5700-C.
“The client is very happy and the boys working with the machine and finishing the concrete really love it,” reports Shayne. Aran Australia, the Power Curber dealer for Australia and New Zealand, has been instrumental in the Smiths’ success. 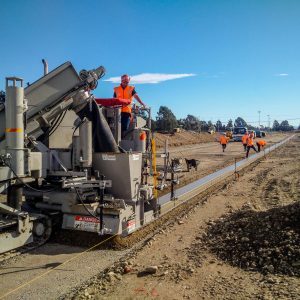 “It’s been great to have the support of Power Curbers and our local dealer, Shane Dunstan (of Aran Australia), too,” says Shayne. While it’s still early in their slipforming days, A E Smith has found success with their 5700-C, and plans to move to stringless machine controls in the future. “We’re really looking forward to what the Power Curber will potentially do for the growth of our business,” Shayne says.